Low flow on its way….Ready, set, go! Sonoma County Water Agency (SCWA) is off and running towards permanently lowering minimum Russian River summer flows forever. Once this occurs, the risk of water quality degradation that includes increased algae and possibly toxic algae, is a virtual certainty, along with all the other problems that entails. Emergency water conservation requirements relaxed by the State for North Coast. Urban Water Management Plans about to be adopted and submitted to State. 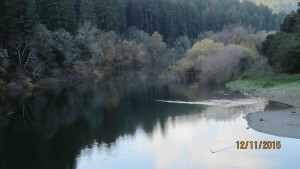 Fish Flow Project EIR (renamed “Sonoma County Water Agency’s Fish Habitat Flows and Water Rights Project”) will address permanently lowering summer flows in Russian River to satisfy Biological Opinion. Lower flows necessary to accommodate Estuary Project….Given that the Fish Flow Project: Environmental Impact Report (EIR) will be released soon, it’s critical that the Estuary Project be viewed in its larger context, especially since this important annual community meeting will occur about two months before the release of that document. For those unfamiliar with the deceptive title, “Fish Flow Project”, that is the name for the project that, if approved, will permanently LOWER minimum summer flows. Conflicting needs: drought, conservation, and inadequate housing….2015 has flown by so rapidly, we barely caught our breaths and now it’s gone. First and foremost, the year was marked by drought. Media filled us with daily messages to save water, exchange grass for cash, take shorter showers, turn off water when we brush, etc. It was even suggested that the dog be allowed to lick your dishes clean. Quotes from RRWPC documents or copies of whole documents should include full acknowledgement of group name, website address, title of article or letter, author, and date of work. Unless otherwise noted, Brenda Adelman is author. Please return signed letter to RRWPC at P.O. Box 501, Guerneville, CA 95446 by March 9th, 2017 and we will submit.